1st floor of a Basque villa, totally independent with large balcony and ocean view. exposed beams, garden and barbecue area, 2 bedrooms, large living room with sofa bed, dining room, kitchen area (washing machine, dishwasher, fridge, grill-microwave, hob, coffee maker, toaster), dining room bathroom (shower and bathtub), wireless internet, flat screen television, beach and shops on foot, free unlimited parking. Public transport to Biarritz in the North (10 minutes), Saint Jean-de-Luz and the Spanish border in the South, 400 meters walk. Train station and airport 15 minutes. We had a very pleasant stay, and Michel was very helpful. Very much enjoyed meeting Michel and getting to know the area. Unfortunately we arrived just in time for bad weather. Wind and rain most of the week. We did venture out in search of sunshine and made it to Pamplona, San Sebastián, Biarritz, Bayonne and many other towns. Easy drive from Bidart. We will plan another stay and hope for better beach weather. J'ai beaucoup apprécié la famille de Julie. Discrétion, cordialité, bonne humeur malgré un très mauvais temps, inhabituel en cette saison. J'aurai plaisir à les recevoir à nouveau pour qu'ils puissent mieux profiter de nos belles plages. Le logement a été laissé dans un état impeccable. 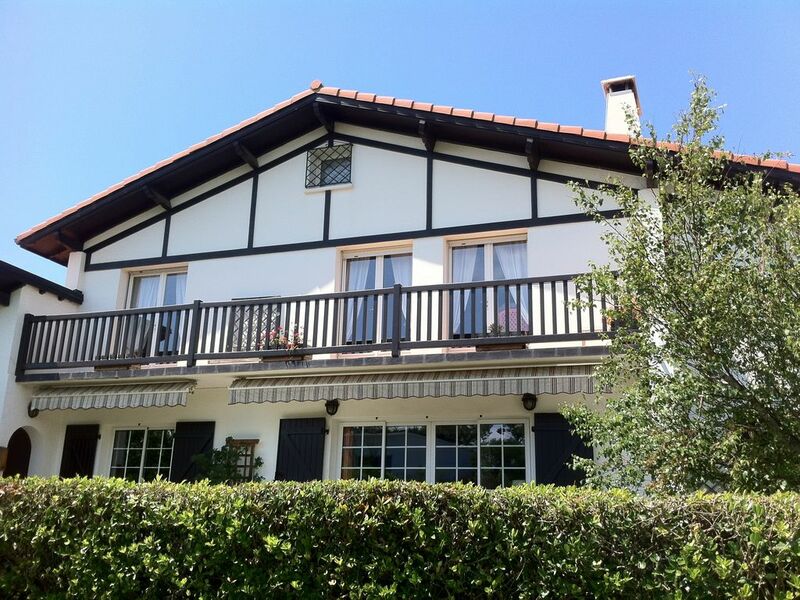 It was a joy to stay in this typical Basque house in a residential area. It was spacious and comfortable and amazingly had views of the Pyrenees at the front and the Atlantic Ocean at the back! We loved sitting in the pretty garden in the afternoon and on the huge balcony in the evening. The house is very conveniently placed. Bidart village is only a 15/20 minute walk for shops and restaurants, while a bakery is only five minutes away. There is a huge choice of stunning beaches very close by and a regular bus service which took us to Biarritz or St Jean de Luz in fifteen minutes! Michel, the owner, was a genial and unobtrusive host, who provided us with all the information we needed about the area and local activities. We had a brilliant time! J'ai eu un très grand plaisir à accueillir Diane et Peter au 1er étage de ma villa. J'ai particulièrement apprécié leur courtoisie et leur discrétion. Je suis content qu'ils aient apprécié l'environnement de Bidart et de ses plages. et la tranquillité de ce quartier résidentiel. Je souhaite n'avoir que des hôtes de leur qualité. Maison près de commerces, de l'océan et du centre du village. Le propriétaire est très serviable et accueillant, tout en étant très discret. En somme, un séjour parfait! J'ai beaucoup apprécié la famille de Sylvie. Discrétion, cordialité, bonne humeur. Echanges cordiaux. Des hôtes, parents et enfants, de qualité. Maison laissée dans un état impeccable.